The Cuban Diaspora and U.S. Cuba Policy: Who Wants it Changed? For more than 40 years, longer than many people can remember, the U.S. and Cuban governments have not had diplomatic and trade relationships (for a chronology of the U.S. embargo see Kaufman Purcell and Rothkopf, 2000, Appendix A). During most of that time this anomalous state of affairs did not attract much controversy, for it was seen as an intrinsic part of the dominant Cold War rhetoric. The lack of relations with the U.S. did not pose an important challenge to the survival of the political regime in Cuba, for the continued break in relations was part of worldwide strains in international affairs. It allowed Cuba to profit handsomely from the financial support of the former USSR bloc of countries at the same time that it used a well-conceived and managed emigration policy of Cubans to the U.S. for the exit of surplus labor and discontented citizens (Kaplowitz, 1998). All of this changed soon after the miracle year of 1989, as Cuba now finds itself in the most serious and chronic economic crisis of its history. What to do? From the perspective of the Cuban state the answer is obvious: bring in the dollar and the American investor, but do it in such a way that they do not challenge the political hegemony of the regime (Robinson, 2000; Pickel, 1998). Indeed, all the social engineering that is going on in Cuba today can be understood as trial and error efforts to find ways to successfully carry out this balancing act; the ongoing uncertainties and shifts and half steps indicate the inherent difficulties of carrying it out. The prospect of change is at least as complex a problem from the traditional perspective of the Cuban Diaspora of opposition to the regime and its totalitarianism. Over the years, the Diaspora has become very diverse in experiences, professions, perceptions, political outlooks, and intimate life worlds (Dukes, 1999). Most members of the Diaspora cannot be oblivious to the suffering of the Cuban people and thus are attracted to a change in U.S. policy that will bring about change in the society and culture of the island and perhaps a rebirth in freedom. And yet, such a change will benefit their political enemy. Thus is the complex drama of passion and reason of the Cuban Dispora that fuels the so far intractable nature of the controversy over reestablishing relations between the two countries. Fortunately, as is true with everything else, the stalemate is being gradually resolved by time. In the grand scale of things, Cuba has been a near non-entity for American foreign policy, particularly since the disappearance of the Soviet Union. The demise of the socialist world has brought about a radical transformation of the U.S. political elite’s understanding of the prerogatives of superpower status of the American state (for a defense of the U.S. embargo law see Horowitz, 1998; Kaufman Purcell, 2000; Lopez, 2000; for the value of “engagement” as applied to Cuba see Haass and O’Sullivan, 2000). The old anticommunist rhetoric is no longer seen as relevant. In the new climate, what to do with/to Cuba is now increasingly open to the answers offered by the pecuniary interest of influential segments of the American capitalist class (Rosell, 2001; Taylor, 2002), particularly the agriculture and tourism industries (Jayawardena, 2003). What has stopped the normalization of relations is not Washington but Havana. Time is also changing the Cuban Diaspora in myriad ways. Most inexorably, death transforms it. Moreover, as life passes outside Cuba, the exile or migrant changes in unexpected ways, and the all consuming memory of experiences in Cuba gives ways to other emotions and to other understandings. Even as important, over the course of decades different migratory cohorts have enjoined it. The aggregate result is that the Diaspora is now much more heterogeneous than ever before (Bonnin and Brown, 2002), much more attuned to the subtleties of life in the U.S. and the rest of the world, perhaps more sophisticated than before about what sort of future would be best for the homeland. This is the setting for this paper, presenting an empirical analysis of Cubans’ opinions on the matter of normalization of diplomatic and trade relations between the two countries. The analysis presented here uses un-weighted data and is based on all the Cuban-origin respondents (n=312) included in the survey. The dependent variable asks the respondents “Do you approve or disapprove of re-establishing diplomatic and trade relations with Cuba? It was scored 0 and 1 (yes). Twelve predictors were chosen to represent the dimensions of ideological conservatism, acculturation, immigration experiences, and demographics that are often assumed to be important determinants of attitudes of Cubans in the Diaspora towards the present day Cuban government. Abortion. Do you think abortion should be legal in all cases, legal in most cases, illegal in most cases, or illegal in all cases? Scored 0 through 3. Political. Did you come to the United States to escape political persecution? Scored 0 and 1 (yes). Republican. In politics today, do you consider yourself a Republican? Scored 0 and 1 (yes). Traditionalism, a multi-item scale ranging from –14 to 18. Attention to Politics. How much attention would you say you pay to politics and government? A lot, a fair amount, not much, none at all. Scored 1 through 4. Citizen. Are you a legal citizen of the United States? Scored 0 and 1 (yes). Language. What language do you usually speak at home? Only Spanish, more Spanish than English, both equally, more English than Spanish, or only English. Scored 1 through 5. Golden Immigrants scored 0 and 1 (for immigrants that came before 1969). Send Money. Do you regularly send money back to your relatives in Cuba? Scored 0 and 1 (yes). Age. What is your age? Scored 18 through 89. Education. What is the last grade or class that you completed in school? None or grade 1 through 8, High school incomplete, High school graduate, Business, technical or vocational school, some college, college graduate, post-graduate training. Scored 1 through 7. Gender, scored 0 and 1 (for males). We use binomial logistic regression (BLR)3 on all categorical variables to model the respondents’ attitudes towards reestablishing trade and diplomatic relations with Castro’s government. We tested the model assumptions of BLR; in terms of its additivity, extensive exploratory analysis indicated that there were no statistically significant second-order interaction terms in the models presented. 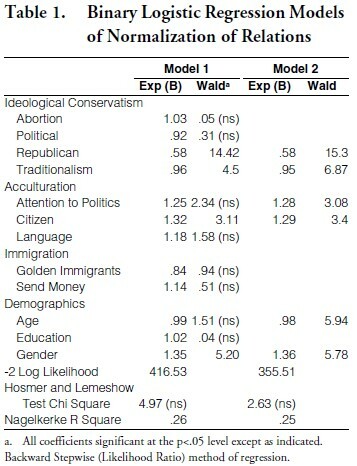 For example, interaction terms of Age with Golden, Republicanism with Golden, and Education with Traditionalism did not add to the analysis substantively or improve the statistical fit of the model. In term of its linearity, mathematical transformations of the continuous predictors (Age, Education, Traditionalism) did not strengthen the overall fit of the model. There is also the absence of multi-collinear relationships among the predictors in the model; all of their tolerances are above .60 (except for Language (.49)), as well as the absence of statistically significant residuals. Table 1 presents two BLR models. The first model includes all of the predictors. In the second BLR model, the Backward Stepwise (Likelihood Ratio) method of regression is used to identify a more parsimonious subset of statistically significant predictors. In both models, the Hosmer and Lemeshow’s goodness of fit test indicate that the models do not differ significantly from the observed data. There are a number of surprising findings in these results. As model 2 indicates, respondents who considered themselves members of the Republican Party, if compared to respondents who were not Republicans, tended not to want rapprochement with Castro (B=-.55), the log odds are about one half that they would want to change the existing policy. More generally, it is the case that opposition to the change in policy is stronger among conservative, traditional respondents; a one-unit increase in the traditionalism scale decreased the desire to change the policy by B=-.04. An interest in politics is associated with an increasing desire to change the policy; thus, the more the respondents put attention to politics the more they favored a policy of rapprochement; the log odds go up .25 for every increase in reported attention to the political process. Moreover, naturalized respondents also favored it. They had a B=. 25 log odds to desire the change if compared to the non-naturalized. Finally, two demographic variables, age and gender, also proved to be statistically significant predictors of the desire for a change in policy. A year’s increase in the age of the respondents was associated with a negative effect; a B=-.02 log odds that they would disapprove of the change. Moreover, men were almost one third more likely than women to approve it (B=. 31). Assumptions that are prevalent in some mass media and public discussions about the attitudes of the Cubans in the U.S. towards the policy of rapprochement (Grenier and Pérez, 2003) did not receive support from this research. For example, as shown in the models, the so-called Golden exiles, or respondents who came to the U.S. in the immigration cohort immediately after the post 1959 Castro exodus and are considered the quintessential political refugees, were not more likely than other Cubans to oppose the policy change. Other multivariate BLR analysis (not shown, available upon request) indicates that the reverse is also true, and that the so-called Red Worms, or those Cubans who came to the U.S. in the aftermath of Cuba’s present day economic crisis and had personal association with the regime in power, were no more likely to support the policy change. Similarly contradicting the opinion of some, respondents who had family in Cuba and regularly sent money to them were no more likely than other Cubans in the U.S. Diaspora to approve of the change. This is also true of respondents who stated that they came to the U.S. to escape political persecution; they are no more likely than other Cubans to disapprove of the policy change. It is also worthwhile to mention that the so-called second generation—Cuban-origin native born respondents—were not more likely than the foreign-born Cuban respondents to support the policy change (not shown, available upon request). Given the contrary assumptions made by some observers of the Cuban Diaspora about the supposed important political differences among the generations towards the Castro regime (Grenier and Pérez, 2003, 93-95), these negative findings are extraordinary and unexpected. 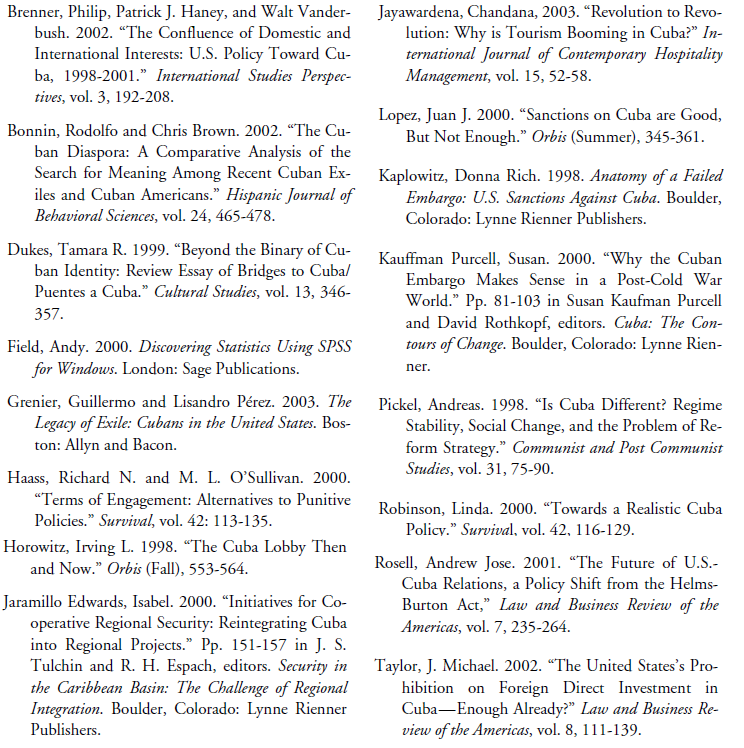 They contradict commonly expressed assumptions about the attitudes of the Cuban community in the United States towards the desirability of U.S. policy change towards Cuba, its assumed emotionalism, intolerance and irrationality (Grenier and Pérez, 2003, 92-93), instead documenting the high level of maturity in the thinking of Cubans about the issue. Their desire for a change in official policy towards Cuba is not a reflection of degree of support of the present day regime in power. The most statistically important predictor in the models was whether or not the respondents identified themselves with the Republican Party.4 Opposition to the policy change is by now an article of faith among conservative Republicans in the Cuban Diaspora, 5 and it is not inappropriate to suggest that until now the Party’s stand on the Cuba policy is an important reason for the vote of Cubans on behalf of Republican Party candidates. This happy coincidence is bound to change, however, as the search for profits by American corporations in a future Cuba helps jettison increasing number of national Republican Party officials from their traditional approach towards Cuba (Brenner, Haney, and Vanderbush, 2002). In the meantime, the acculturation of Cubans into the society and culture of the United States, such as obtaining citizenship, gaining command of the English language, and knowledge of political news, makes them, both those in the first and the second generation, more prone to want to abandon the present policy. Thus, when the shift in the national Republican Party’s stand towards Cuba happens, as I believe it will, large segments of the Cuban community in the Diaspora will be ready and waiting, defusing the issue and its impact on voting behavior, and thus making it less painful for the Republican Party. 2. Washington Post article reprints from the Latino survey and information about the survey can be obtained from the Kaiser Family Foundation publications request line at 1-800-656-4KFF; also at www.kff.org. 3. For a review of BLR see Field, 2000; another excellent discussion of BLR is found in http://www2.chass.ncsu.edu/garson/pa765/logistic. htm. BLR is appropriate for the present case, for it is designed to model a dichotomous dependent variable with categorical and continuous predictors. 4. Opinion polls (e.g., Time/CNN, January 7, 2000; CBS News/New York Times, October 25, 2000) indicate that both nationwide and in Florida, Republicans, if compared to Democrats and Independents, have a slightly greater tendency to oppose opening diplomatic relations with Cuba. They also show (e.g., ABC News, May 13, 2002) that the majority of respondents would like the U.S. government to lift travel restrictions. 5. Grenier and Pérez (2003, chapter 7) assume the presence of a conservative, anti Castro “exile ideology” among large segments of the Cuban-origin population in the U.S. However, our findings indicate that this ideology exists only among a small segment of this population.